You are invited to a Special STRESS AWARENESS Show “How To Move From Stress to Joy” broadcasting on ChriSOULa’s GoldenMuseTV dedicated to embracing HOLISTIC Health and Healing for Conscious, Joyous and Prosperous Living. 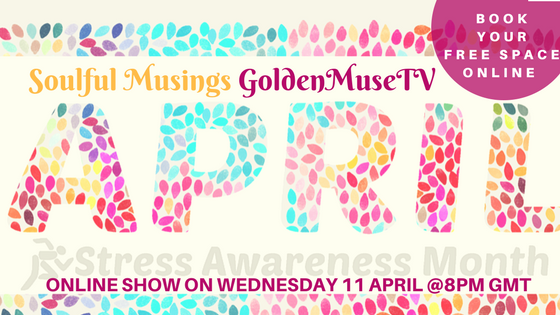 BOOK your FREE space ONLINE on eventbrite HERE Click on PRACTICALITIES to receive guidance how to get ready and connect on GoldenMuseTV show. What creates stress – is stress always bad for us? By the end of the show you shall be receiving enlightening insights, practical tools and guidance that you can easily implement in your everyday life. 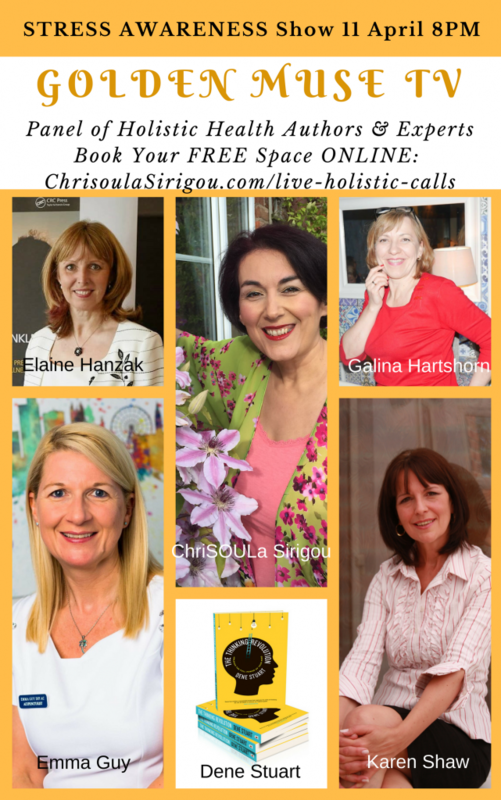 This show is dedicated to all of you LIFE explorers (parents, entrepreneurs, evolutionary coaches, social workers, carers) who are curious and serious to embrace a stress free life at home, at work, in your community, and at the same time, say YES! to a more mindful, conscious and joyous living. There will be a Q/A session at the end of the discussion. Stay until the end and you shall receive a few amazing surprise gifts! The show is recorded and then uploaded on ChriSOULa’s YouTube Channel. Subscribe here and watch LIFE Inspiring conversations, interviews and shows at your own pace and time. I think that stress is a fearful reaction to life’s constant changes. It’s an excuse we often use for not taking responsibility for our feelings. If we can put the blame out there on someone or something, then we can just play the innocent victim. Being the victim doesn’t make us feel good, and it doesn’t change the situation. ChriSOULa has for 25 years been teaching the power of heartfelt communication through languages internationally, from teaching young people in private language schools in Greece, business people in France and adults in Further Education Colleges in cosmopolitan London, to empowering British A-Level students through 7-day work experience placement trips in France as a Secondary School Teacher of Modern Languages. She teaches the language and psychology of Colour through Colour Mirrors practitioners training programmes for coaches and evolutionary teachers in the UK, Greece and The Netherlands, a colour system that teaches spiritual self-empowerment. ChriSOULa has also set up colour therapy for kids courses. She is the co-author of “The Book of Inspiration” and currently in the process of writing her book series “The Book of Soulful Musings” Enlightening Insights, Tools and Guidance from LIFE Inspiring Conversations. BOOK 1 Embracing Holistic Health and Healing for a more Mindful, Conscious, Joyous and Prosperous Living – due to be released 13 July 2018. The Pre-launch is happening on 19th April in Nantwich. Connect with ChriSOULa and book contributors in real life and share your message with the world. 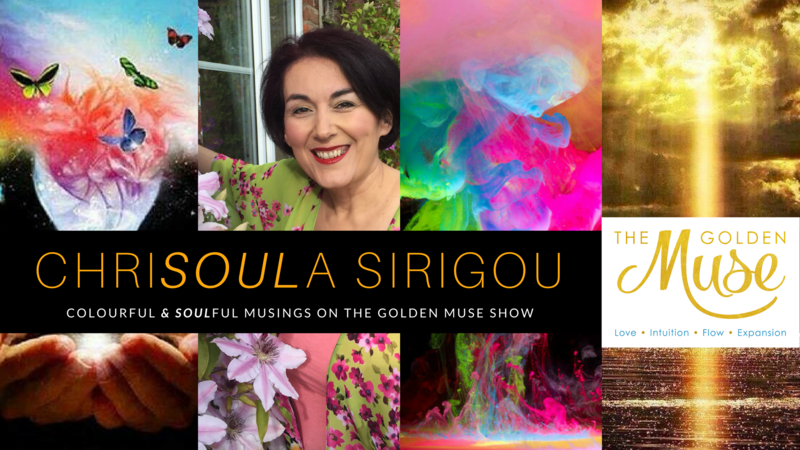 ChriSOULa hosts a weekly live radio show called “The Health and Healing Show” on RedShift Radio and enjoys LIFE Inspiring Conversations on The Golden Muse TV Show. A great number of interviews with heart-centred holsitic health educaotrs and thought leaders are available to watch on her YouTube Channel. She is passionate to empower parents and entrepreneurs to learn how colour principles can help you become more conscious and more prosperous in LIFE. Her mission is to inspire you LIFE-Curious people – LIFE Explorers – to expand in abundance, love and success.